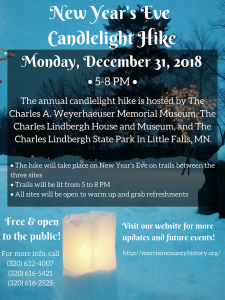 The Charles A. Weyerhaeuser Memorial Museum, Charles Lindbergh House & Museum, and Lindbergh State Park are hosting their annual Candlelight Hike to help families and friends celebrate the new year. The Candlelight Hike will be held Monday, December 31, 2018, from 5 – 8 p.m.
All three sites will be open during the event, giving participants an opportunity to view exhibits, warm up, and enjoy refreshments. Participants can start at any of the sites and hike the trails, which will be lit by luminaries, between the sites. If there is snow accumulation by December 31, people are encouraged to bring snowshoes. During this year’s Candlelight Hike event, the Morrison County Historical Society, which owns and operates the Weyerhaeuser Museum, will be releasing its new publication, a guide that captures the Central Minnesota Remembers Vietnam exhibit. The exhibit, which was created using items loaned by residents from around central Minnesota, will be ending with the Candlelight Hike. The exhibit guide will help the exhibit live on once it is dismantled. Candlelight Hike participants will be able to purchase the guide that evening. Mary Warner, executive director of the Morrison County Historical Society, created the exhibit guide and will be available to sign the publication during the event. The Candlelight Hike is free and open to the public. Volunteers are needed for setting up and lighting the luminaries a couple of hours in advance of the event. Those interested in volunteering or who want more information can call the Weyerhaeuser Museum at 320-632-4007, the Lindbergh House & Museum at 320-616-5421, or Lindbergh State Park at 320-616-2525.